Some ecosystems can survive for a long time, others collapse quickly after disturbance. * Why are some more successful than others? Some studies show some of the answers. Ecosystem functioning involves several processes: production, consumption, and transfer of organic matter to higher levels of the food chain, the decomposition of organic matter, and the regeneration of nutrients. Three texts (Secrets of successful ecosystems, Loss of Deep-sea Species Could Lead to Oceans’ Collapse, Biodiversity conservation secures ecosystem services for people) give information about the role of diversity in the health of ecosystems. Divide your class in three groups (or 6, or 9, if needed). Each group studies one of the texts, and makes a presentation about the information given. They concern bacteria, worms or diversity more generally. The questions can help to prepare your presentation, but collect more information, and discuss the problem in your group. And too much dispersal makes them ‘generalists’. Explain this too. 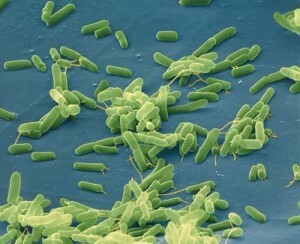 They isolated the organisms after 400 generations, how long time will that be? And how much time would 400 generations be with mice. And with humans? The article does not tell how many different species had evolved (species being bacteria that can eat certain food sources), but conclude that diversity and possibility of dispersal are needed to make ecosystems successful. Can you imagine what this means for conservation in the ‘big’ nature? How can we make sure that plants and animals can disperse, and diversity can evolve? What do we mean when speaking of ‘biomass’, and what is exactly ‘biodiversity’ and ‘biosphere’? Use your own words to explain. The deep see is “by far the most important ecosystem for the cycling of carbon, nitrogen, and phosphorus” . Describe the cycles of C, N, and P in nature. If you do not know, find out. Nematodes are the most abundant type of animals on earth, but most people do not know them at all. Mostly they are very small. They often live in and on other types of organisms. Find more information about these animals. 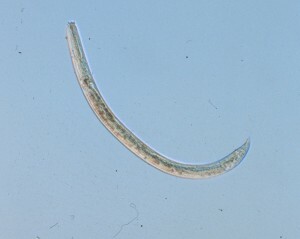 Diversity of nematodes means also diversity of other live forms. Can you explain why of how higher numbers of species make way for more species. (use an example from a land ecosystem that you know, like a forest). Deep sea ecosystems are invisible for us, but very important. Try to imagine how collapse of deep sea ecosystems could influence our life (Thus why protecting it is important to all of us). What can each of us do to protect the oceans? What do we mean when speaking of ‘biodiversity’ and ‘healthy ecosystems? Use your own words to explain. Economy usually does not count the value of nature but they should do so. Give more than one argument to give nature (or ecosystems) money value. When undisturbed nature would be given economical value, many poor countries would be called rich. And ‘development’ sometimes means ‘getting poorer’. How can we convince politicians that protecting nature is economically clever. “Protecting these intact forests is critical to reducing emissions from deforestation in developing countries while also supporting the livelihoods of traditional and indigenous peoples”. How does deforestation promote Carbon emissions? Give examples of traditional and/or indigenous people who depend directly on the forests? Why is reducing diversity often causing collapse of ecosystems? Investing to maintain healthy ecosystems or in preventing climate change is expensive, but certainly cheaper than letting the climate change and fight the consequences later. Explain this, and try to find examples. 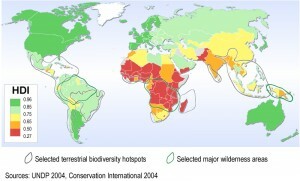 When you look at the map, you see that ‘biodiversity hotspots’ are mainly in the poorer part of the world. What does this mean for the possibilities of protecting them?